Two weeks ago I went to my LCS for their Wednesday night auction.I picked up this 1952 Bowman Gil McDougald RC for $4.50. It's not in great shape, but I love it. I've always wanted to get the RC of every player to win the Rookie of the Year Award. McDougald won the 1951 A.L. Rookie of the Year Award. 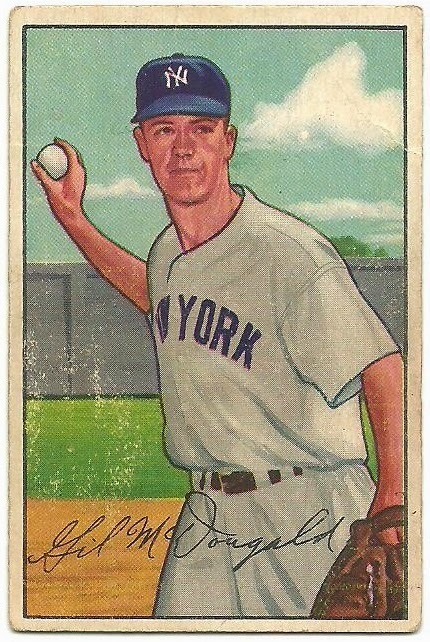 McDougald was a 5 time All-Star during his 10 seasons with the New York Yankees and was on 5 World Championship teams. 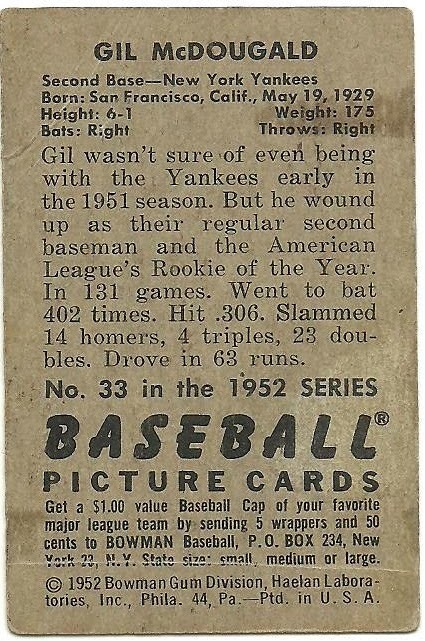 He retired after the 1960 World Series because he thought the Yankees wouldn't protect him from the expansion draft and didn't want to end up on the Angels or Senators. He was just 32 years old. Henderson Alvarez pitched a no-hitter against the Detroit Tigers on the last day of the 2013 season. 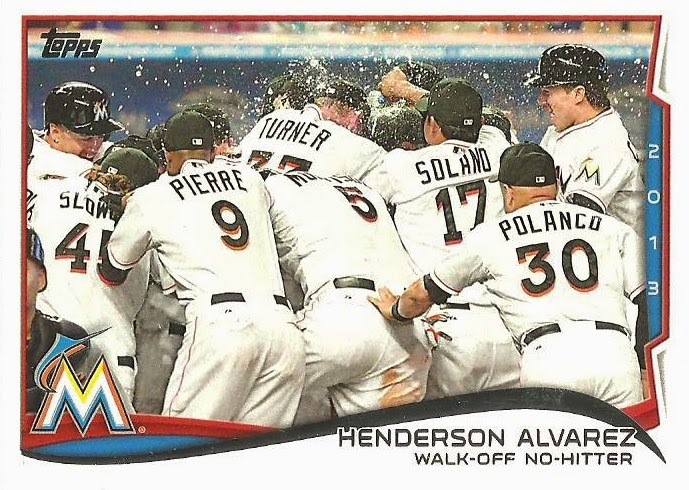 The Marlins had failed to score during the first 8 innings, so it wasn't until the bottom of the 9th when, with Alvarez in the on-deck circle, Giancarlo Stanton raced home on a wild pitch by Luke Putkonen. I hope no one gets the wrong idea from the title of the post. This post is strictly baseball/baseball card related. Come on people! 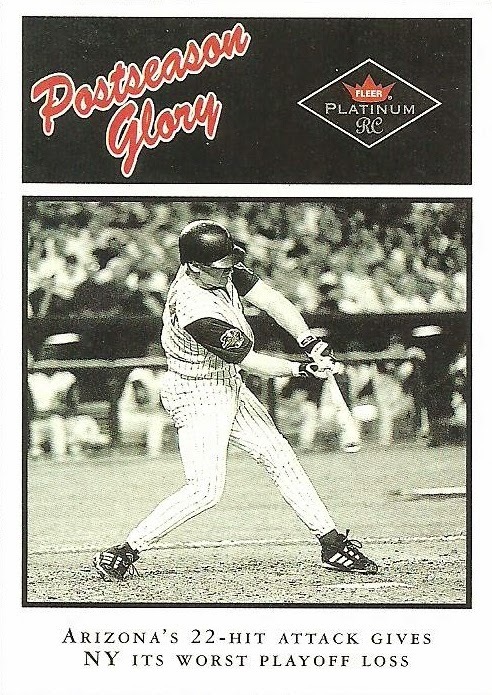 This 1996 Pinnacle Aficionado card came in a package recently from Jeroen, The Dutch Card Guy. I was planning on having it be a part of my Commenting on cards from The Dutch Card Guy (Part #5) post, but after a little research I knew it needed its own post. 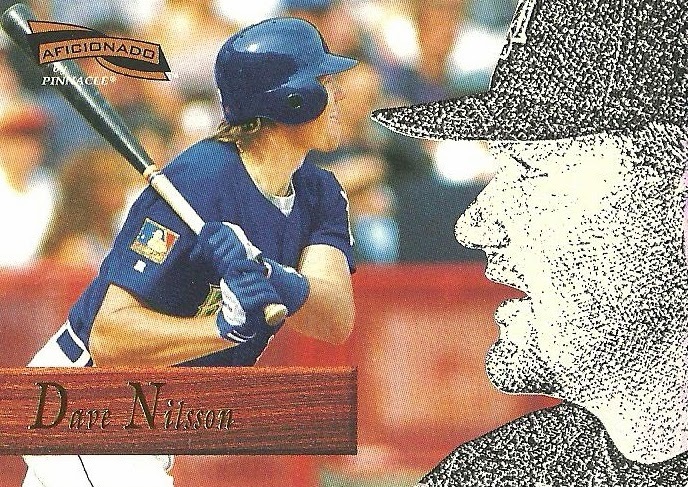 I saw the "a.k.a THUNDER" on the back and wondered how Dave Nilsson got a nickname like Thunder. 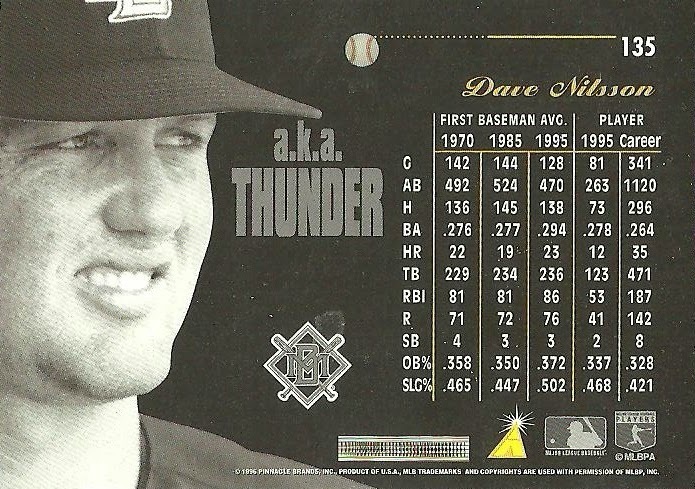 Then I realized that he's from Australia, so you see, Dave Nilsson is literally Thunder from Down Under. The only thing that would make this better is if it listed his birthplace on the back of the card. The Dutch Card Guy recently sent me a package from overseas and I'm going to finish up my commentary on it. 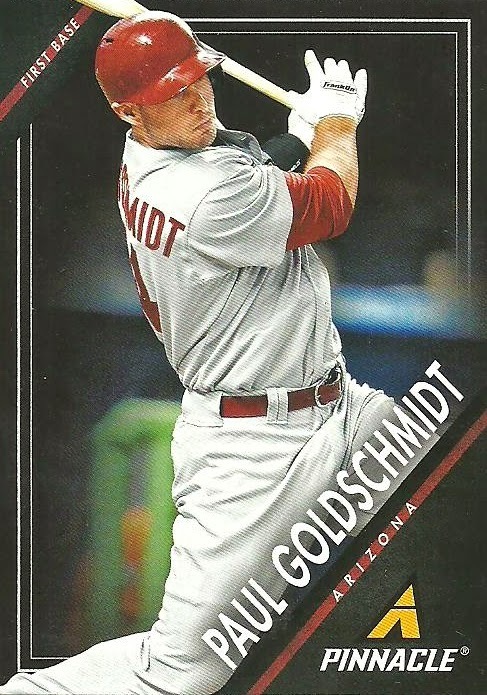 There were a couple of Goldschmidt cards, which are always appreciated! 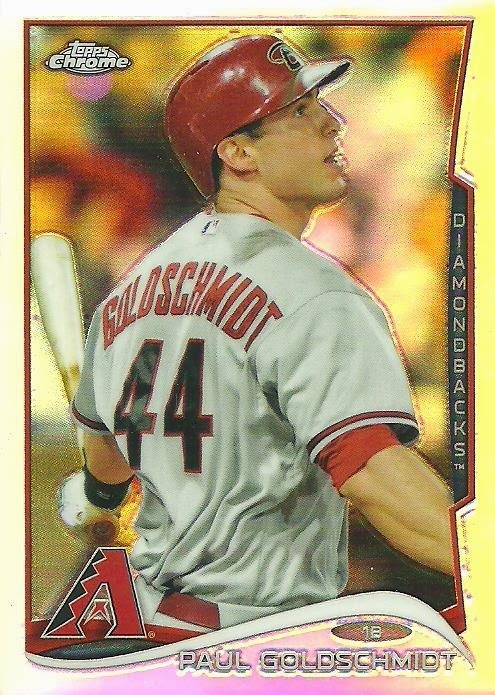 I saw that Goldschmidt took batting practice yesterday for the first time since braking his hand. He should be good to go by Spring Training. 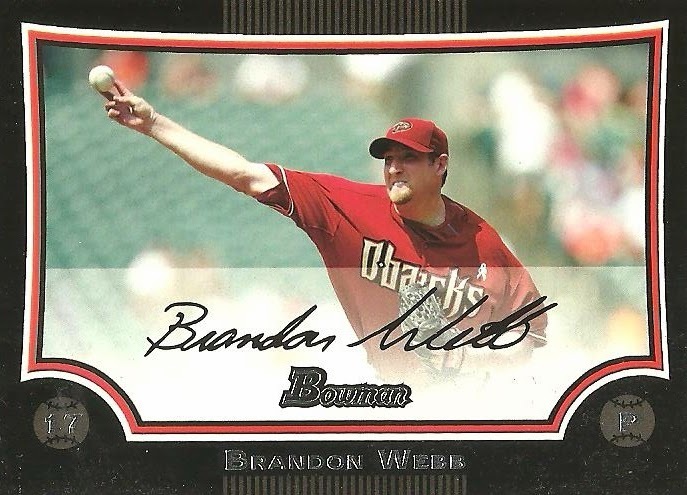 There were also a couple of Brandon Webb cards for my player collection. 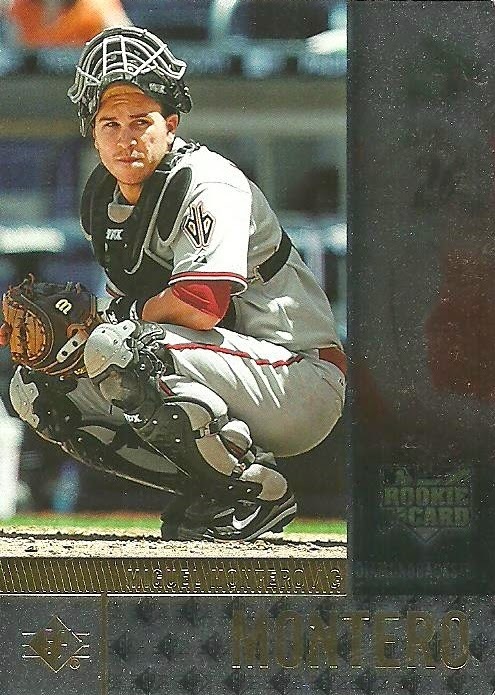 Next up are a couple of Miguel Montero RC's. 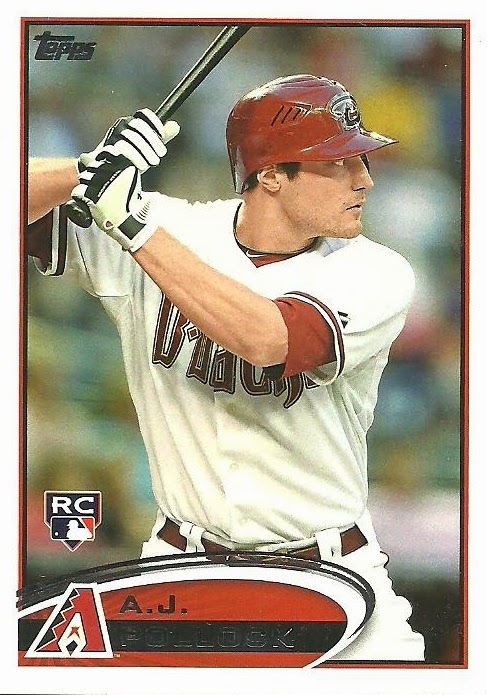 Montero is one of my favorite current D-Backs. 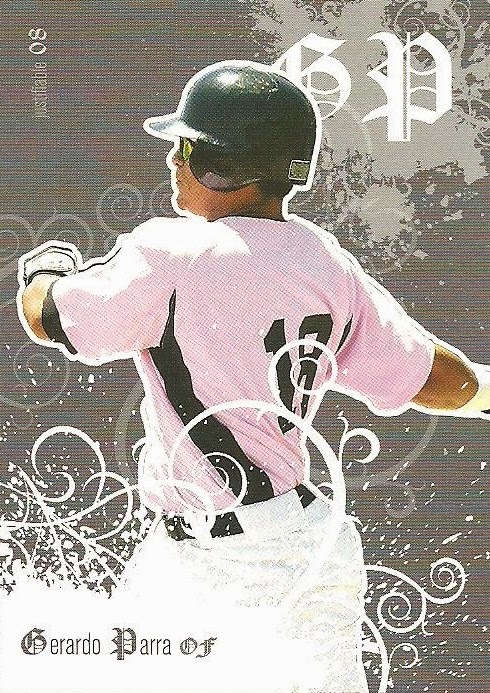 Here's a Gerardo Parra card that I had never seen before. Hard to even tell that it's Parra from the picture. 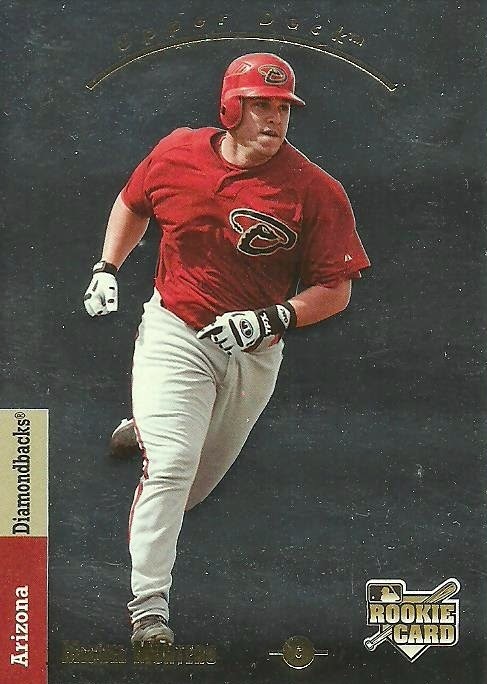 The only non D-Backs cards in the package from The Dutch Card Guy were two 1996 Pinnacle Aficionado cards. These cards are awesome and I'm glad they found their way into the package! The head shot on the front of the card is textured. Check out the back. 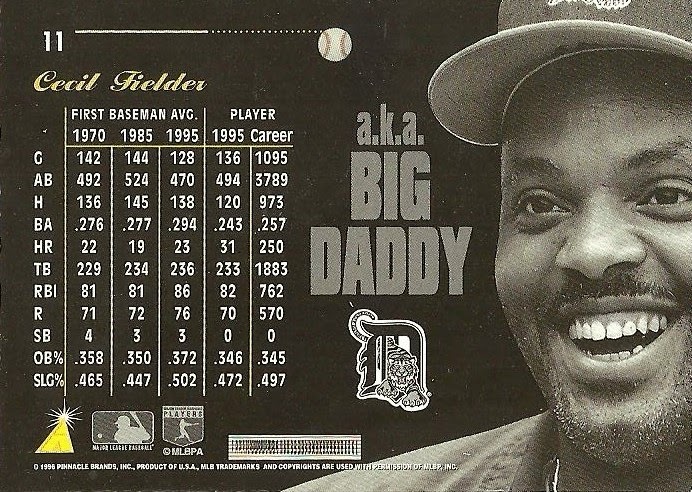 The stats include First Baseman Averages from 1970, 1985, and 1995 for comparison against the actual player. Not sure why they went with 1970 rather than 1975, but still a great concept! Then you get the nickname! I'm going to finish up my commentary on the cards that I got recently from Cervin' Up Cards. 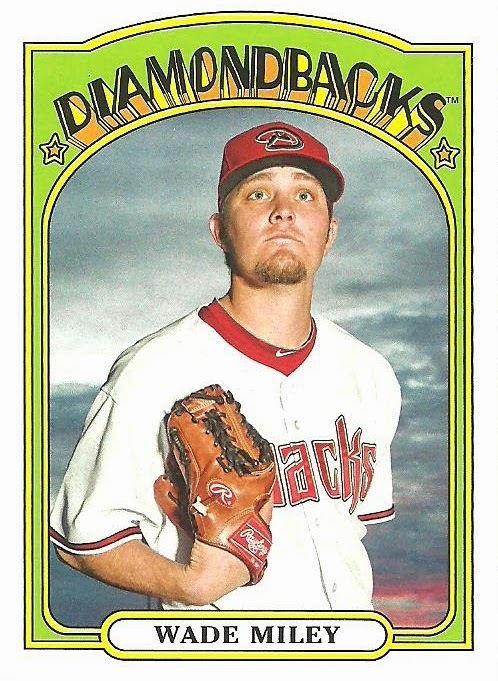 This Wade Miley card cracks me up. Just the look on his face is hilarious. 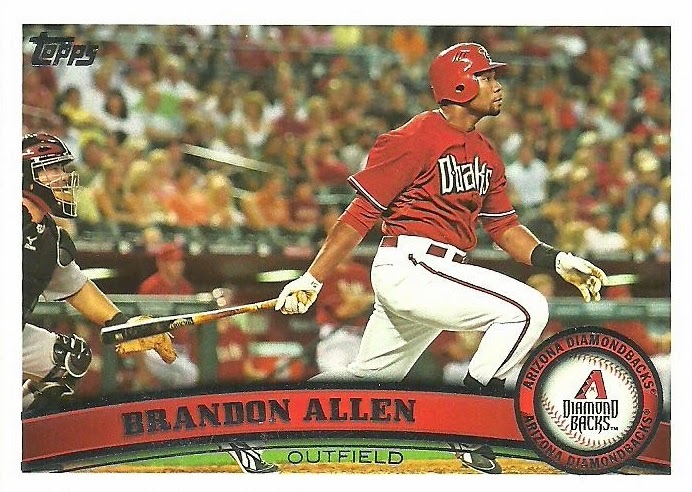 This Brandon Allen card has an awesome looking photo! 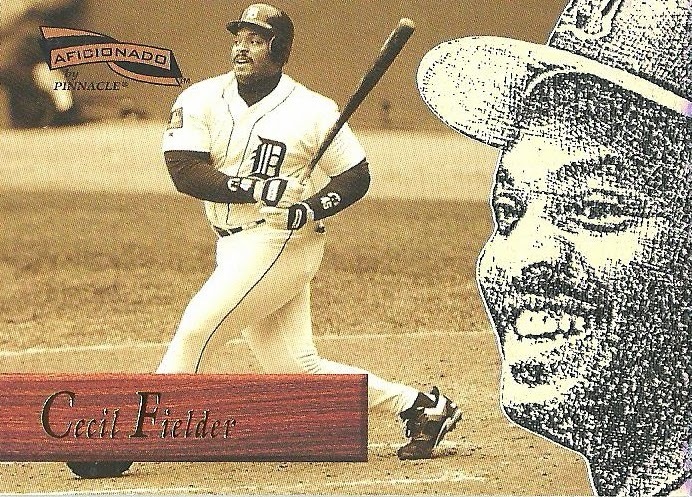 I'm imagining that he just hit a home run. 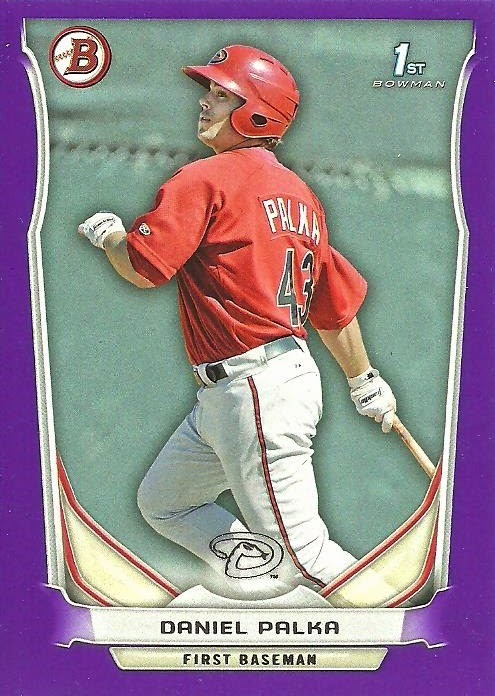 There were several 1st Bowman cards of guys who haven't made it to the big leagues yet; including these Daniel Palka cards. 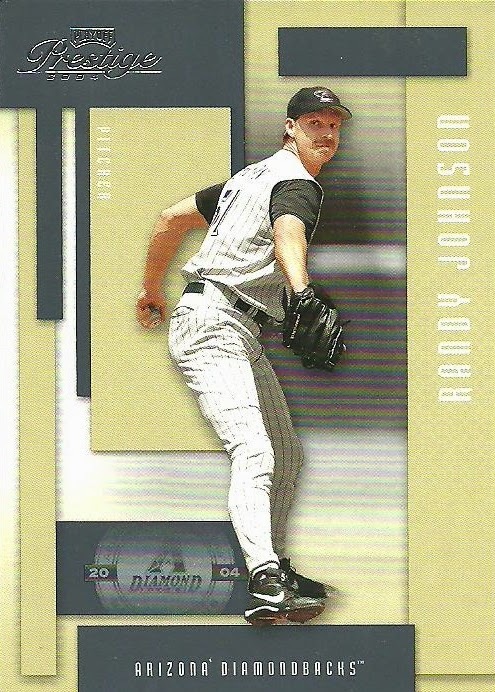 This 2002 Ultimate Collection Randy Johnson card is my favorite card from the package. It's numbered to 799. 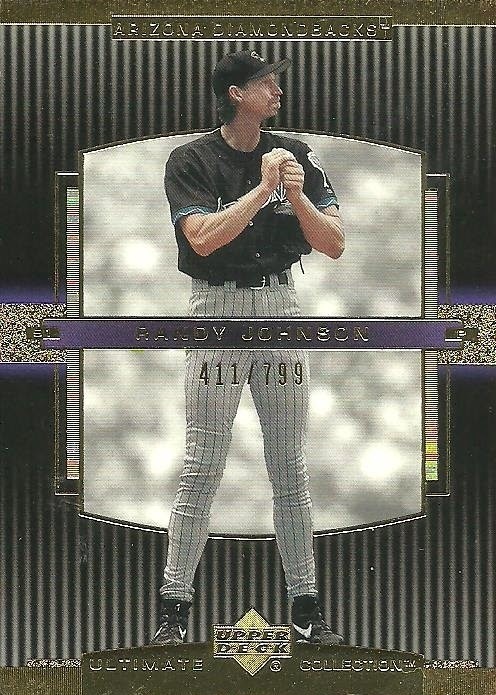 I think I only have one other Ultimate Collection card in my collection and it's a Randy Johnson jersey card. 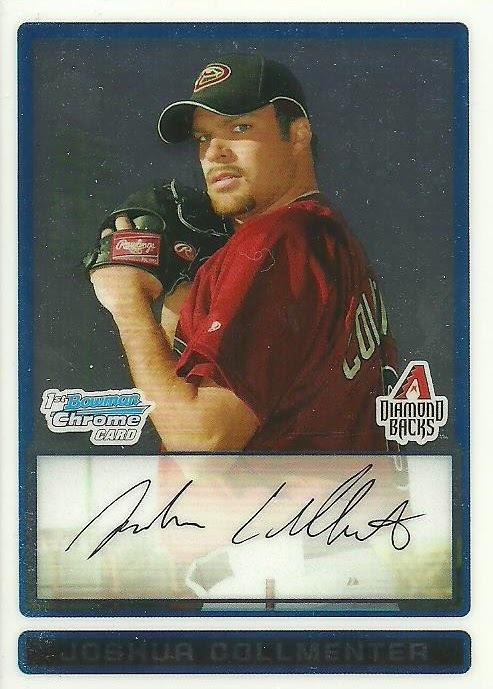 The Dutch Card Guy sent me a package of cards recently that included these 2009 Bowman and Bowman Chrome cards of Josh Collmenter. Collmenter has had a pretty good season and I'll never forget his 3 hit shutout against the Reds this season where he faced the minimum of 27 batters. Collmenter has a unique delivery which can be seen here. 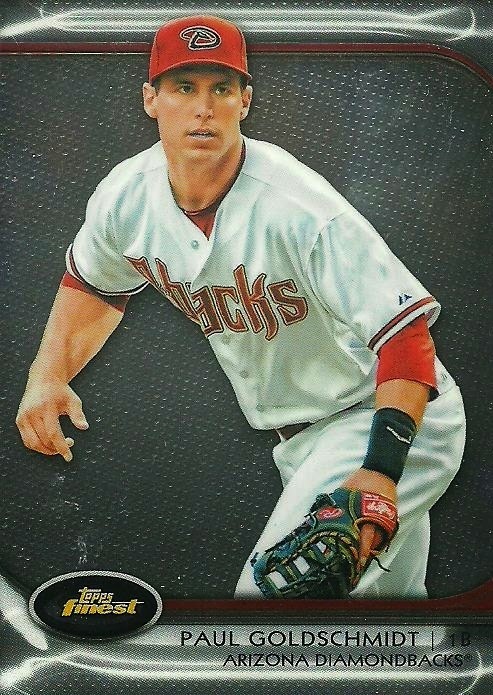 Cervin' Up Cards sent me a sweet package full of D-Backs cards recently. 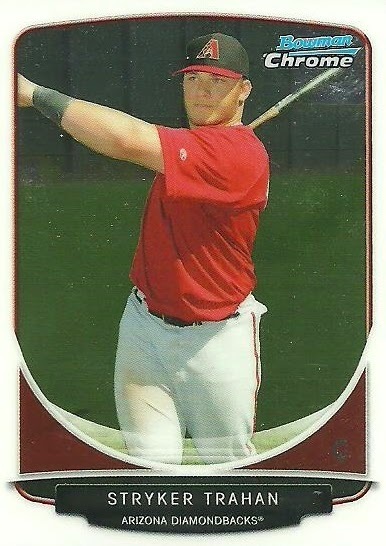 This 2013 Bowman Chrome mini of Stryker Trahan was in the package. Stryker was drafted as a catcher, but switched this year to the outfield. Stryker is a different name. You might wonder how he got his name. Well...wonder no more. His parents must have been big fans of Burt Reynolds as private investigator B.L. 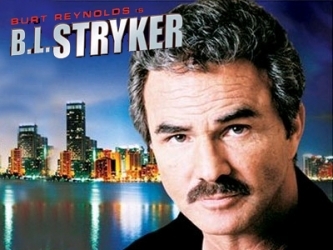 Stryker, or at least they were fans of the name Stryker! The Dutch Card Guy sent me a package recently. 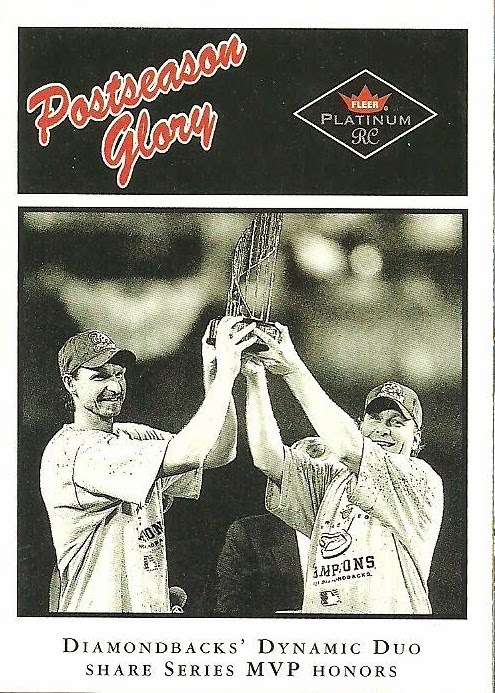 He included a few Randy Johnson cards including this Awaiting the Call insert from Pinnacle. Here is the back. Johnson will be eligible for the Hall of Fame next year. Johnson was a 10 time All-Star, 5 time Cy Young winner, 300 game winner, is second all-time in strikeouts, was a World Series MVP, and pitched a no-hitter as well as a perfect game. Johnson was the most dominant pitcher I have ever seen. He is a 1st ballot Hall of Famer. I only have two questions. What percentage of the vote will he get? What team will be on his cap or will he go without a cap like Greg Maddux? I really hope he goes with the D-Backs. Jeroen also sent me the Artist Proof version of the card. What team do you think should be on Johnson's cap in the Hall of Fame? Expos, Mariners, Astros, Diamondbacks, Yankees, or Giants. Alright, so there are only two real choices, but what team should it be and what team do you think it will be? 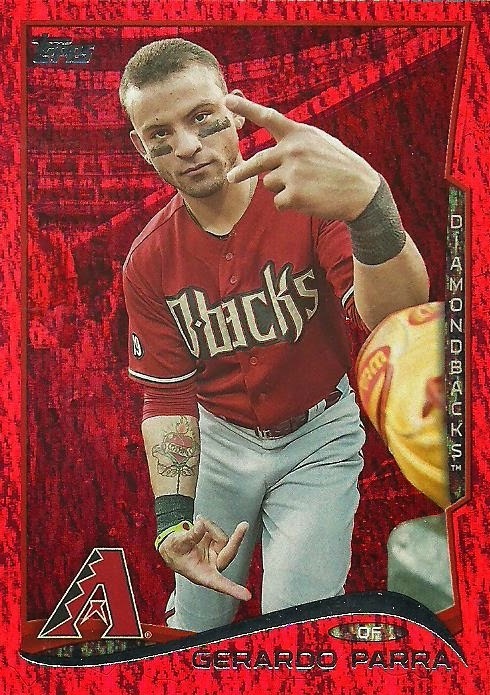 Cervin' Up Cards recently sent me a package of D-Backs. 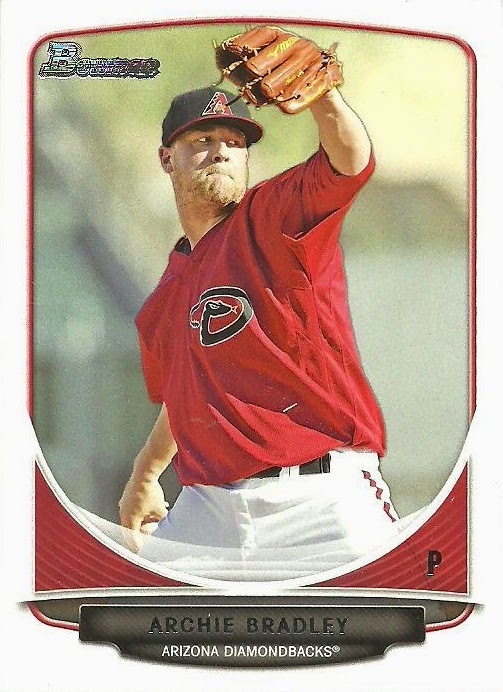 It included these two cards of D-Backs pitching prospect Archie Bradley. 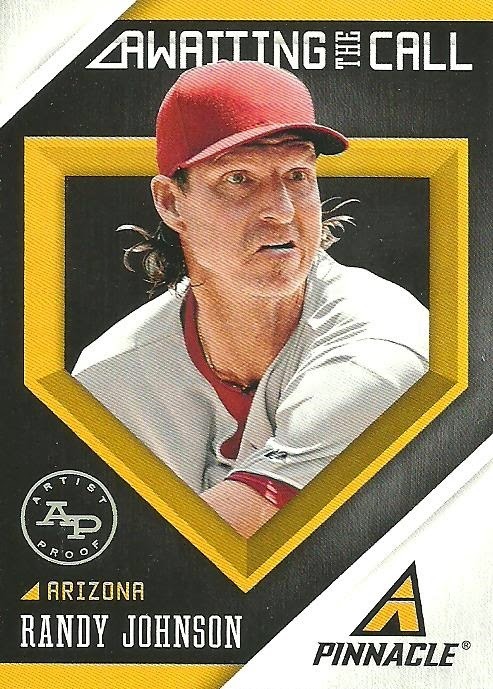 Bradley was the 7th overall pick in the 2011 MLB draft and signed with the D-Backs prior to going to the University of Oklahoma to play quarterback and pitch. I know I thought Bradley would have already made his debut by now. In AAA Reno this year Bradley is 1 - 4 with a 5.18 ERA, a far cry from 2013 where he was 14 -5 with a 1.84 ERA. 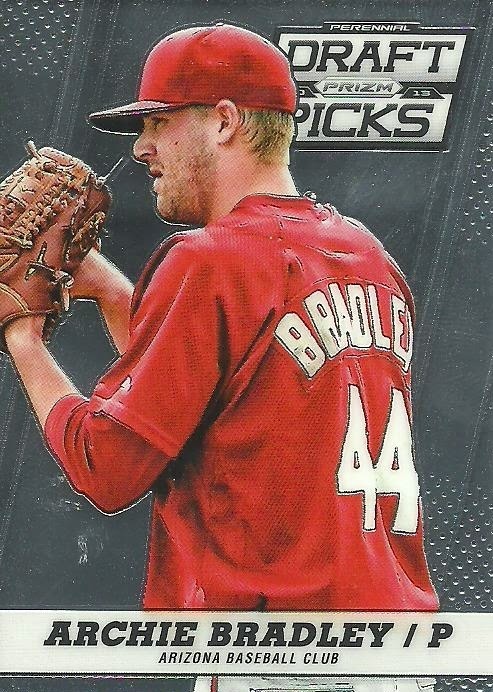 Hopefully Bradley will have a great off season and Spring Training and be a part of the D-Backs rotation next season as they look to bounce back from a rough 2014. 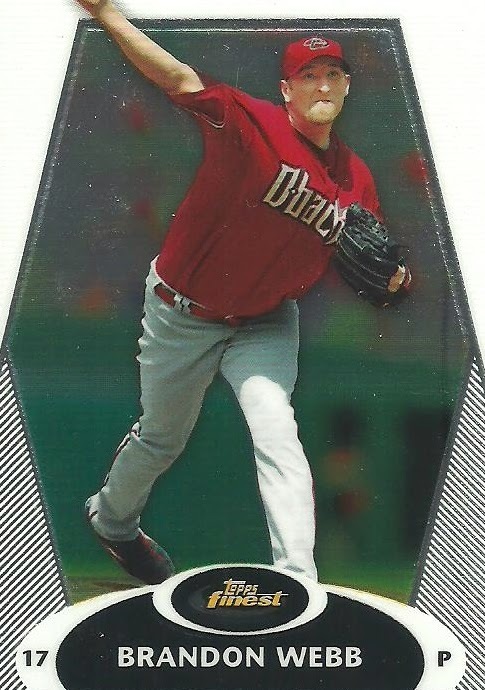 The Dutch Card Guy sent me a package of D-Backs recently. These 3 cards were part of the package! 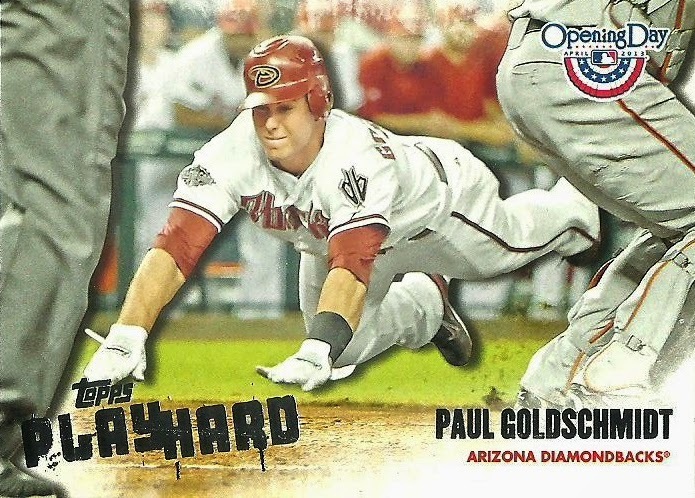 These cards represent a great time in D-Backs history! 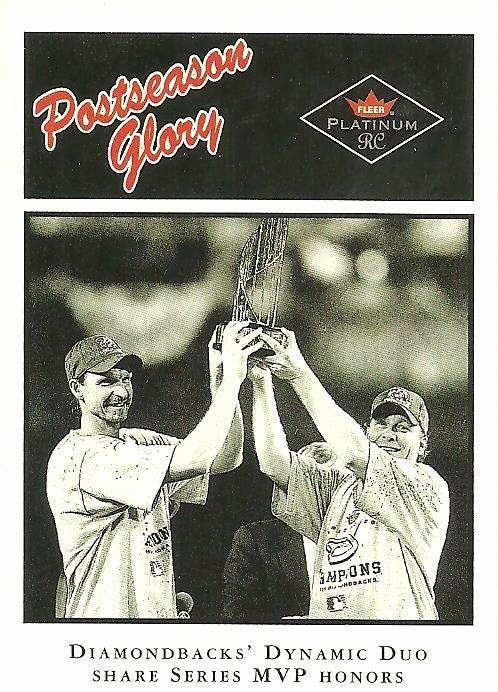 I really want to complete this Postseason Glory subset, even those featuring the Yankees. I was surprised to learn that these are from a 2001 set. Obviously they must have come out after that World Series, so it had to have been late November or early December of 2001. 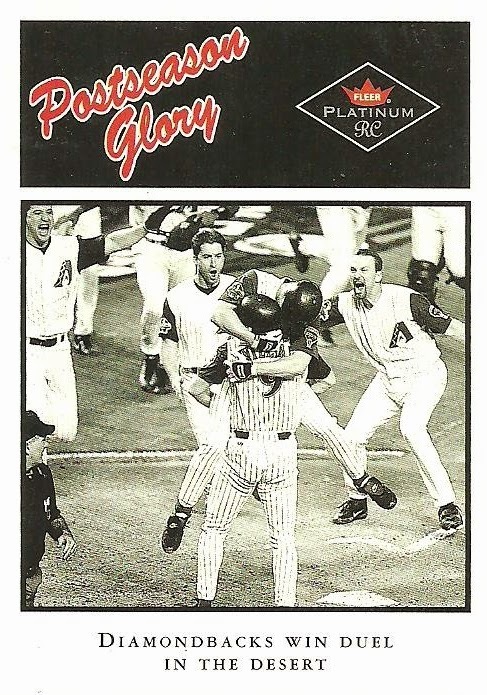 I know I'm biased, because it was the D-Backs, but I think the 2001 World Series has got to be the best World Series that I have ever seen. There was just so much drama. Not to mention the added impact that 9/11 had on the Series. It was either huge blowouts of come from behind victories all the way to bottom of the 9th in Game 7 with the home team winning each game. What is the best World Series that you have witnessed in your lifetime? 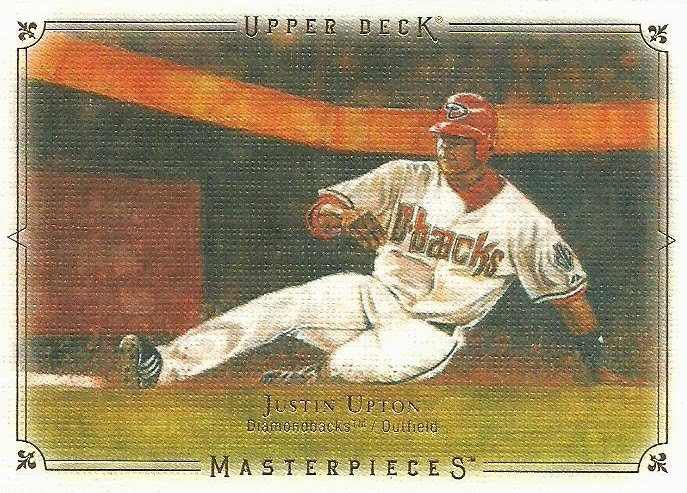 Cervin' Up Cards sent me a package recently with these 4 Justin Upton cards. 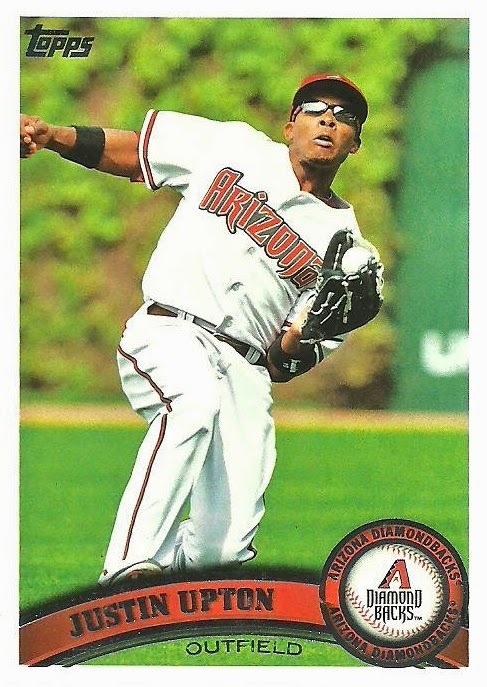 Upton spent six seasons (2007 - 2012) with the Diamondbacks, before being traded to the Braves. 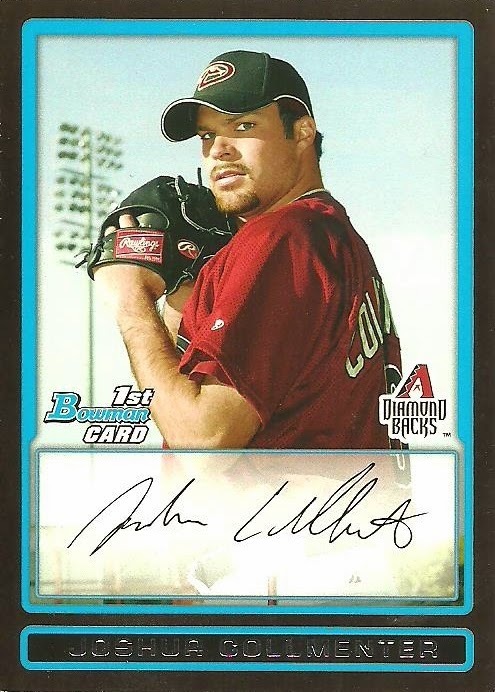 He was one of my favorites, if not my favorite D-Backs player, for most of that time. 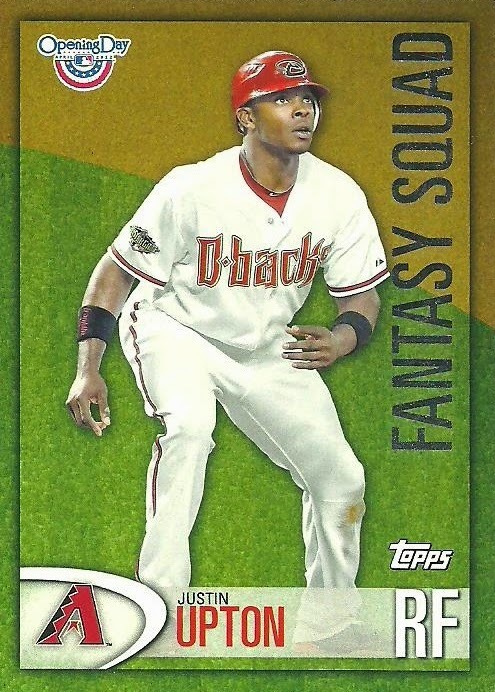 When J-Up got traded I stopped pursuing his cards. 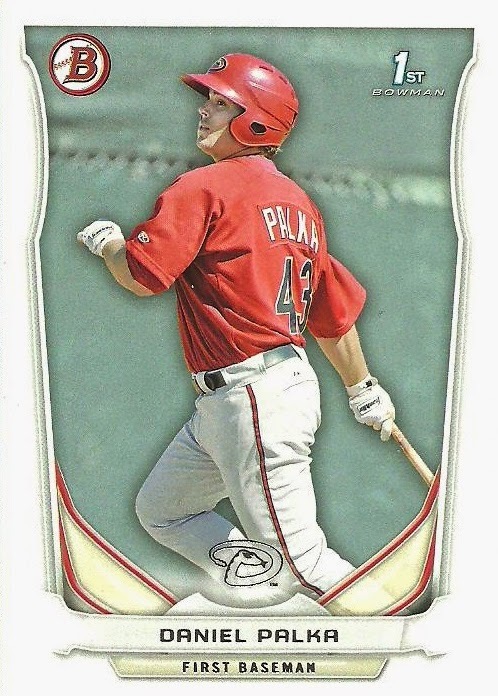 Not just his Braves cards, but I haven't gone after any of his D-Backs cards since he was traded. I guess that means I'm more of a team collector than a player collector. I know I've seen several bloggers out there that specify that they collect cards of players only with them on a certain team, so I guess I'm not alone. 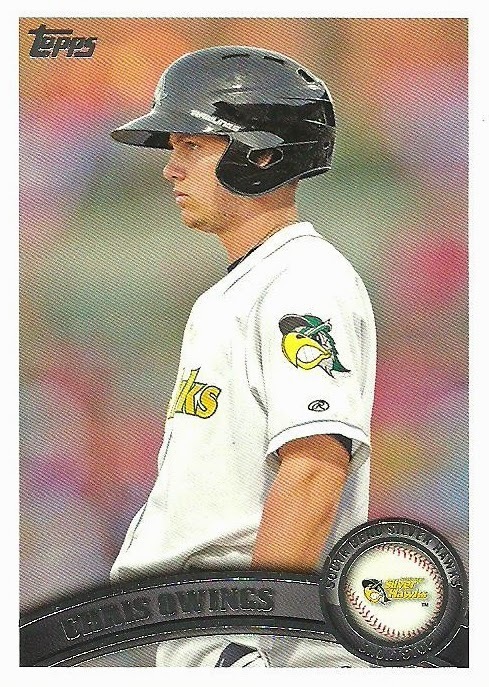 The only player I collect even their cards on different teams is Ryan Roberts. It's just a weird feeling to have been such a big fan of a player and then all of a sudden it stops. Let me know your thoughts on the subject. The Dutch Card Guy recently sent me a package that contained these two cards. 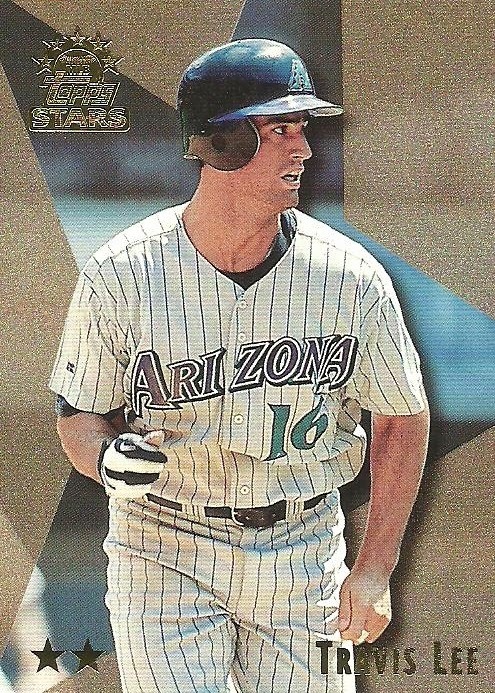 They are 1999 Topps Stars cards of Travis Lee. Both cards are #39. 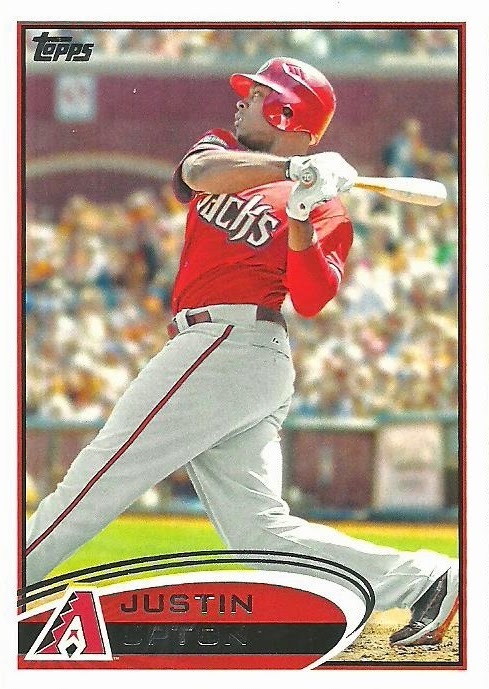 As you can see, Topps took the same photo and then just cropped it for the second card. 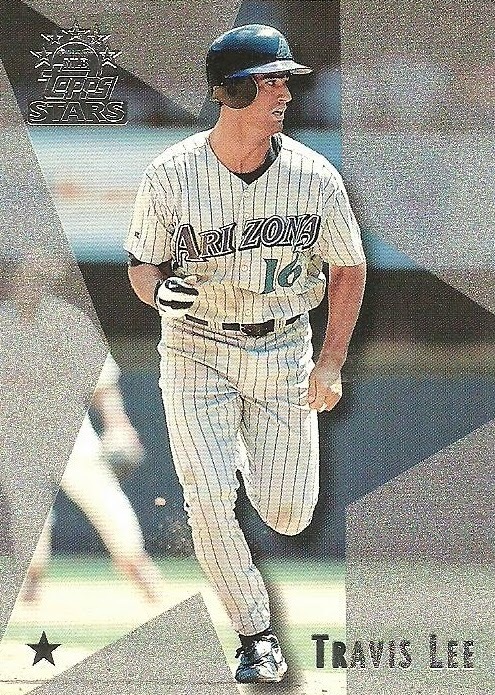 I did a little research and it looks like there are at least 4 versions of each card from the 1999 Topps Stars set, with each one being cropped from the same initial photo. So what do you think? 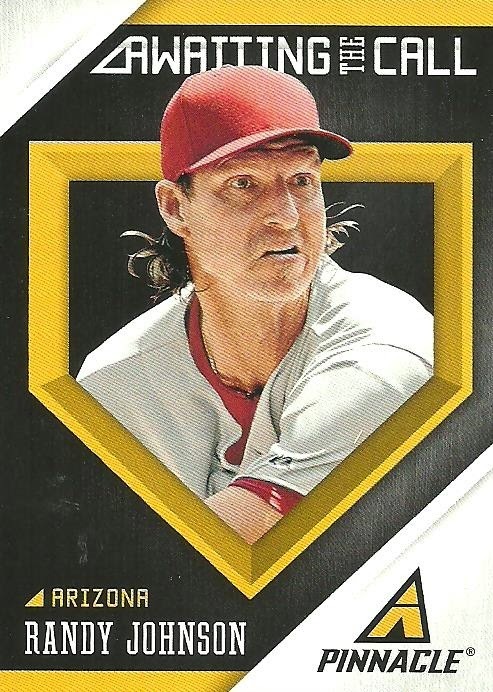 Is this another case of Topps being lazy or is it a cool concept? Is it something that you would like them to do today? This card came in a recent package from Cervin' Up Cards. Do you think we'll ever see the S100 helmets in the big leagues? On Monday I got 2 unexpected packages in the mail! Now, unexpected cards are always AWESOME, but when you recently committed to not making any card related purchases, unexpected cards in the mail are even more AWESOME! 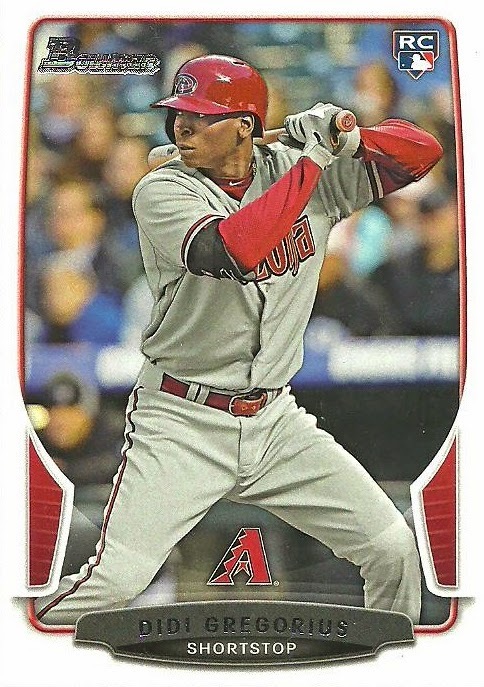 The Dutch Card Guy hooked me up from overseas with a bunch of D-Backs cards as a thank you for helping him secure a mini metal Rizzo card for his collection! Thanks Jeroen! Here are just a couple of the cards that he sent. More will follow with commentary. I was then Zippy Zapped by Kenny of the blog Cervin' Up Cards! Thanks Kenny! Here are a few of the cards he sent. More will follow with commentary. The straw that broke the camel's back! I'm done....at least for a while. I hate buying supplies and $3.60 well spent!